More than 60 brave surf dogs are expected to Hang 10 (errr, 20) for a great cause at the 3rd annual "Loews Coronado Bay Resort Surf Dog Competition" on June 28 in Imperial Beach, Calif. Each dog will have three waves (or chances) to impress a panel of professional judges and will be scored on confidence level, length of ride and overall ability to "grip it and rip it." 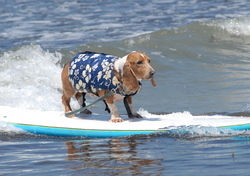 OB Elvis Dude, a Basset mix, took home Third Place at last year's Loews Coronado Bay Resort Surf Dog Competition. See Spot surf at the Loews Coronado Bay Resort Surf Dog Competition on June 28, 2008 in Imperial Beach, Calif. - the nation's largest surfing competition for man's best friend. There's no dog paddling for these surf dogs. Canine counterparts are invited to hang 10 (errr, 20) for a great cause. 9:30 to 10:30 a.m. Optional surfing lessons by the Coronado Surfing Academy for less experienced canines eager to catch their first wave. 11 a.m. to 12:30 p.m. Heat One and Heat Two: Surf Dogs. Dogs will be divided into two heats based on their weight. 12:30 to 1:30 p.m. Heat Three: Tandem Surfing for Dogs & Owners. 1:30 to 1:45 p.m. Furry fashion show with doggie couture. Visitors can update their pooches' summer look with fashions presented by Lucky Dog Boutique. 1:45 to 2 p.m. Awards ceremony. Judging will be conducted by Mayor Jim Janney, Mayor of Imperial Beach; Kathleen Cochran, general manager of Loews Coronado Bay Resort; and Teevan McManus, owner of Coronado Surfing Academy. Each dog and team will have three waves (or chances) to impress the judges and will be scored on confidence level, length of ride and overall ability to "grip it and rip it." The first place winner of each heat will score a ton of great prizes, including a getaway at Loews Coronado Bay Resort and a feature in Modern Dog Magazine, the leading lifestyle magazine for modern dogs and their companions. Above all, surf dog champions will enjoy the endless bragging rights that come with owning the waves of San Diego. The cost to enter the competition is $45 for Heats One or Two and $50 for Heat Three. There is no cost to attend and watch. In addition to the Loews Surf Dog Competition, canines, owners and spectators will enjoy a variety of burgers, dogs and snacks prepared by the talented Chefs of Loews. All proceeds will benefit the Resort's Good Neighbor Council. To register or for more information, please visit http://www.LoewsSurfDog.com. Loews Coronado Bay Resort's Good Neighbor Council is proud to donate all proceeds to its Good Neighbor Partner, Modest Needs Foundation. Since its inception two years ago, the Loews Surf Dog Competition has raised more than $10,000. The Loews Surf Dog Competition stems from an overwhelming response to Loews Coronado Bay Resort's Su'ruff Camp package, which was named "an amazing thing to do with your dog" by Life magazine and Modern Dog magazine. Since Su'ruff Camp debuted in December 2005, more than 50 hotel packages have been sold. For more information on Su'ruff Camp or the Loews Loves Pets program, please visit http://www.loewshotels.com. Created in 1990 by Jonathan Tisch, Loews Hotels Chairman and CEO, the Loews Good Neighbor Policy is the company's formal commitment to a long-standing tradition of understanding its responsibility to the communities where Loews Hotels owns and operates hotels. Loews Hotels' Good Neighbor Policy was awarded the President's Service Award, the highest honor given by the President of the United States for community service directed at solving critical social problems. Situated on a private 15-acre peninsula surrounded by the Pacific Ocean and Coronado Bay, Loews Coronado Bay Resort is located just minutes from downtown Coronado, a charming resort village, and a short drive to San Diego's world-famous attractions. Resort amenities include direct access to the Silver Strand State Beach, three tennis courts, a private 80-slip marina, three acclaimed restaurants, 440 sea-inspired guest rooms and suites, and panoramic views of the San Diego-Coronado Bay. For more information, please call 619-424-4000, 800-81-LOEWS or visit http://www.loewshotels.com. Zoe, a Jack Russell Terrier, owner Scott Chandler and his 8-year-old daughter Tyler, took home First Place at last year's Loews Coronado Bay Resort Surf Dog Competition.